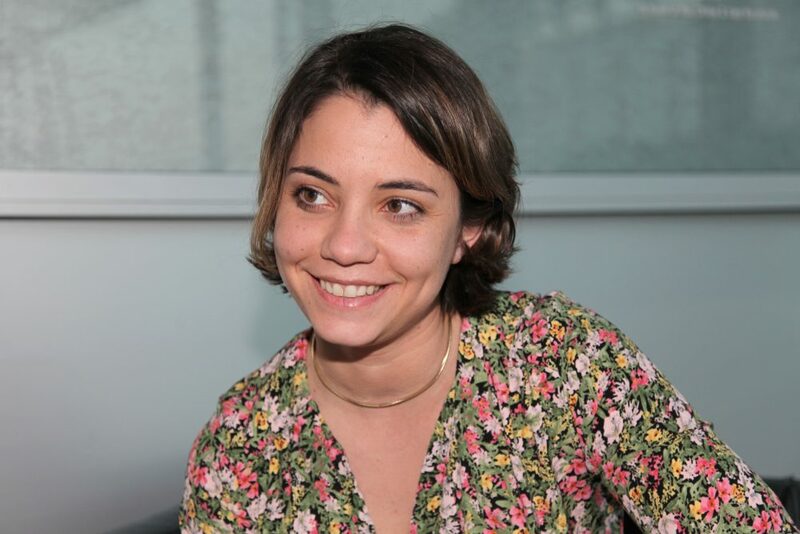 Natalie Kitroeff is an economy reporter for The New York Times and a former Los Angeles Times reporter. Before moderating a Zócalo/UCLA Anderson event titled “What Will Trump’s Trade Wars Do to the U.S. Economy?” at the National Center for the Preservation of Democracy in downtown Los Angeles, she spoke in the green room about how she became a reporter, how she stays sane by watching reality TV, and her Super Bowl close encounter with some rowdy Eagles fans. Was there a teacher who really influenced you, maybe influenced you to become a journalist? The funny thing is, I only took one journalism class in college. My teacher was a New York Times reporter at the time, Lisa Belkin. I actually was in a different journalism class, a sports writing class, because I love sports. But I went over to her class and begged her to let me in, and she did. It was a class that was basically about storytelling around conflict, and personal interest storytelling around political conflict and stuff like that. And it was incredible, it was an amazing class. She taught me about writing and about storytelling, and it was really fun. And I took the class and I thought, “Great, this is fun, and now I’m going to go into academia.” And I went to a think tank for eight months and then she called me and said, “There’s this job opening at the Times, would you be interested in it?” And it was her friend, [Times columnist] Nick Kristoff. So I became his assistant. I had to interview and compete with a bunch of people, but I wouldn’t have even heard about it or thought about it, had it not been for her, and for her class. You say you like sports, and I hate to ask, but is this brace on your leg a result of that? What did you do? I broke it celebrating the Eagles winning the Super Bowl. I was in Philadelphia when we won. It was the best moment of my entire life—even with the break. I would give up all my bones for that experience. And we went out on the street and it was kind of like, not a riot. We were on Broad Street. There were just like a ton of people, and I essentially got run into. It was an accident. Knees are very fragile. An accident? With Philly fans? They do have sort of a rep. I know, I know! But everyone was happy. It was just a lot of adrenaline on the part of everyone. And you got bumped into? Bumped is an understatement. People were kind of being really rowdy, and I’m really short. And these were big men. I’m sorry! So what sports do you play when you’re not wearing a knee brace? I play tennis still. I used to play other sports. When I lived in L.A. I could play tennis all the time. Of course in New York it’s a little …. I do miss L.A.! I love New York, though. I love both places, they tug at my heart. The weather here, it’s always 75 and kind of slightly windy, like a little bit of a breeze. You don’t have that in New York. In New York it’s mostly gray. But New York is just so much attitude and kind of sharpness. So were you a lifelong Eagles fan? Were you initiated by your parents? No, my mom is Canadian and my dad’s Greek. So they kind of had to warm up to “American football,” as my dad calls it. My mom liked the Eagles a lot, and in Philly—even though I was in the suburbs—it’s very difficult to escape. It was a part of school, it was a part of everybody that I hung out with. It took a little while, but basically by high school I was devoted. For better or worse. Roxanne Gay’s Bad Feminist. It’s so well-told, but it often kind of makes you angry. I’m also reading Boeing versus Airbus: The Inside Story of the Greatest International Competition in Business, by John Newhouse, which is not something that a lot of people would read for fun, but I am. It’s excellent, especially if you like airplanes, which I do. I just started getting into the world of aircraft and aerospace manufacturing. I used to run. Now I don’t run. I watch reality television. I watch the “Real Housewives.” I try to watch something that feels a little more sane than the everyday reality in which we live sometimes. And so that has been reality TV these days. I read a lot and listen to podcasts, but sometimes you need a little more of an escape. I don’t recommend breaking your knee, that’s all I would say. It’s a lot of housebound.